Ruth Ann is still looking for this pony. She salvaged from a fire one rather fuzzy picture where he is off to the side amongst other stuff animals. I enhanced the pony with photo editing software, so this is only an attempt to show what he looked like. I am desperately searching for a childhood stuffed toy. It is a wind-up musical baby toy, and I *think* it is from Gund, but that is only a vague memory. 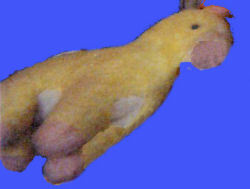 He was a yellow pony with a white under-belly and pinkish feet/snout. He had black eyes (not of cloth material) and his nostrils were just yarn stitched on. He had a yarn like tail and yarn mane as well. The small silver wind up mechanism was on his side, and it played “It’s a Small Small World”. I was born in 1983 and always remember having the toy. I would assume then it is from the late 70’s or early 80’s, but it may be earlier (handed down from a relative). It was destroyed in a fire in 1997, and I’ve been looking since the day of the fire. In 2007, that will be 10 years of desperate searching and late nights on the internet. Ruth Ann says that this giraffe is pretty close, but hers didn’t have the saddle like that and had a white underbelly. It also didn’t have blue eyes; however, that one plays It’s a Small World, so she wonders if they made it differently depending on the year. Can you help me please? It is more important than words can express that I find this. If you can help Ruth Ann find this long lost musical pony that means so much to her, THIS SITE IS NO LONGER ACTIVELY MANAGED. Please use Our FREE FACEBOOK GROUP, including #072706 in the subject, . Maybe you don’t have one, but you can help us identify the brand or the name of the toy. Any information would be so helpful to her. Maybe the only help you can give her is to put a post on your blog, linking to this one, so more people will read her request. I know almost exactly what kind of horse you’re talking about. I too had one of those when I was a child, and it helped me fall asleep every night. I’m not quite sure of the make, it didnt look like alot of GUND toys, but I lost mine as well and have been looking for one. Good luck with your search! Sorry for the double post, browser issue. Tami, that is close but not it. The enhanced photo posted above is quite accurate. Thank you all for still looking!! Could it be from Dakin? I have a musical teddy bear that plays that song. made by the same company..it does look kind of similar. Thanks for being on the lookout! That’s cool:). There is another on ioffer.com, made by GUND, again not exactly like your one but worth a look – Item No. 111358457. Is he more like your one? Cheers Brenda. This is not exact but close. Might help make gain info. Thanks for keeping your eye out! Definitely still searching! That’s pretty darn close, but mine didn’t have the saddle like that and had a white underbelly. It also didn’t have blue eyes; however, that one plays it’s a small world so I wonder if they made it differently depending on the year!! Your different year variation theory may very well be true. Here is a similar but again does not appear to be exact. Also Bantam. Ebay #	230611631454 Yellow giraffe, white underbelly, rainbow mane and tail, blue feet. Are you going to buy the one carrie posted? I was born in 1984, and I have the exact pony you are looking for – though I fear I may crush you by saying I would never part with it. 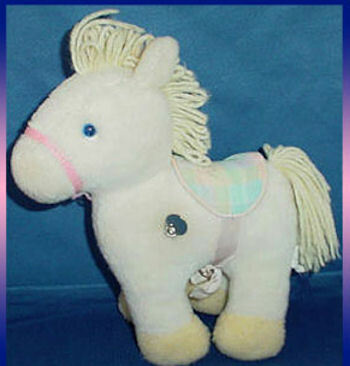 It is a Bantam pony, yellow, with pink ears and feet, and a white tail. It plays “It’s a Small World” from the wind-up on its right side. Sounds exactly like the one you are searching for. I’ll let you know if I ever come across another! Also, Ruth Ann, would you want me to send you a photo of mine? I also have images of the tag, if that would help. That’s FANTASTIC! I’m happy to at least know who made it because now I can search more. Image would be welcome please!!! I’d be happy to send you the photos – how should I get them to you? Thanks, Brenda! The coloring is *definitely* close! I’m really appreciative of this site and that people are still looking. I don’t have any plans on giving up, especially now that I have two kids of my own. what about this lil guy? So close had to show you this one. I can’t help being confused by the second photo in this blog. It doesn’t look anything like your one to me? Can you please clarify if I am on the right track with this one (obviously not quite it as the feet and mussel are not pink and the tail and mane are not yarn) but I would think otherwise quite close. However if photo 2 is close then I am on the wrong track. lol. I was lamenting no success on finding this the other day and lo and behold y’all go and comment. That is so sweet to know someone else is still keeping their eyes open! Jess, I’ve seen a lot of giraffes but no horses 🙁 Brenda, that is by far the closest I have seen!!! The picture on the top is mine. The second is definitely not it so you’re on track with yours. Photo 2 is not close. Photo 1 is the original.